This healthy snack is delicious, healthy and easy to make. - Melt the coconut oil in a saucepan over a low heat. Allow to cool down. - Meanwhile, place the three tablespoons of Xavie's Toasted Seeds in a food processor and pulse to coarse grains (1 to 3 mm). Keep separate in a bowl. - Chop the dates and nuts coarsely and put them in the food processor, together with the nut paste and the cooled coconut oil. Blend until you get a homogenous mass. If necessary, add a small amount of hot water if the dates were slightly dehydrated. - Then add the Toasted Granola to the dates, and blend together until the pieces of granola are about half a centimeter in size. We want another tasty bite. 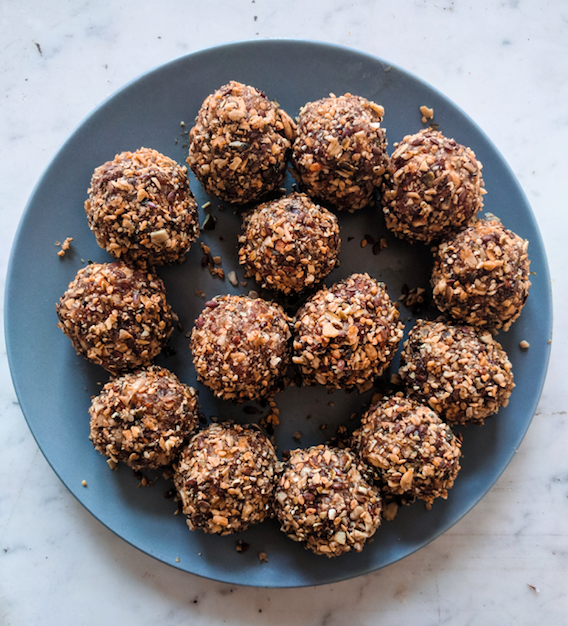 - Check whether you can squeeze this dough of dates and granola into small balls. If not, add a little bit of hot water or melted coconut oil and pulse a few more times. - Make 12 to 16 small balls with moist hands. Press them well and then roll them through the coarse ground Toasted Seeds. - Place the bliss balls in the refrigerator so that the coconut oil can solidify and the balls become firm.